On the occasion of Hindi Day 2017, India-Sri Lanka Hindi conference on E-learning: Identity and possibilities was organised by the Indian Cultural Centre, High Commission of India, Colombo in collaboration with the Hindi Department of the University of Kelaniya on 13 September. 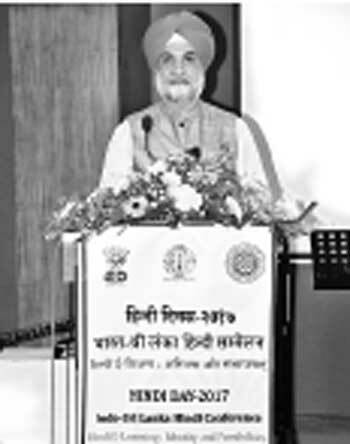 High Commissioner of India in Sri Lanka Taranjit Singh Sandhu and University of Kelaniya Vice Chancellor Prof. D.M. Semasinghe graced the occasion. The High Commissioner appreciated the efforts of University of Kelaniya and other institutions to help learning of Hindi in Sri Lanka. He also stressed upon the relevance of E-learning in Hindi in today’s world and appreciated the first ever e-magazine in Hindi – ‘E-Prayas’ by Indian Cultural Centre which would connect the readers all over the world. The High Commissioner appreciated the increasing demand for learning Hindi in Sri Lanka and said that it would be very useful especially in the hospitality and tourism sector, as large number of tourists speak Hindi. Prof. Semasinghe expressed his gratitude to the Indian High Commission for establishing Long Term Hindi Chair at the Hindi Department and gave his best wishes for the success of the conference. Indo Sri Lanka Hindi Sammelan also featured renowned Hindi scholars from both the countries who presented the papers on the seminar topic. Hindi translation of Sinhala book of Senior Prof. Upul Ranjith Hewawitanagamage, Head, Dept. of Hindi Studies, University of Kelaniya was also released on this occasion. 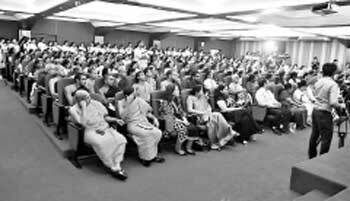 Deputy Vice Chancellor Prof. Lakshman Seneviratne, Emeritus Professor Indra Dassanayake, Dr. Vijay Malhotra, Hindi academicians, students and teachers from all renowned Universities and institutions from all over the island participated in the program. On the occasion of Hindi Diwas 2017 Hindi Pakhwada was held at Indian Cultural Centre which included all island Hindi essay competition, Kabita Sandhya, song and dance competitions for Hindi students, Kendriya Hindi Sansthan certificate distribution and many other programs.